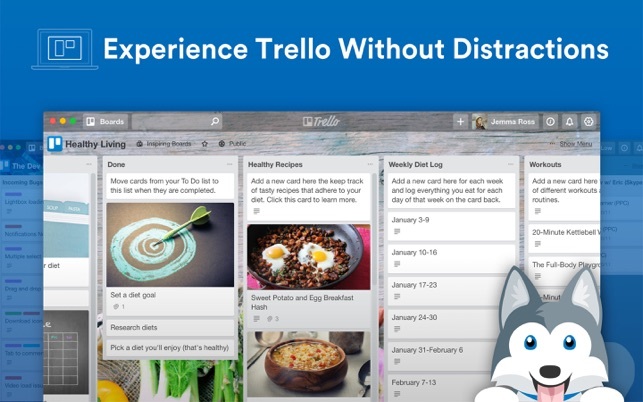 Bring Trello to Mac in a dedicated workspace. 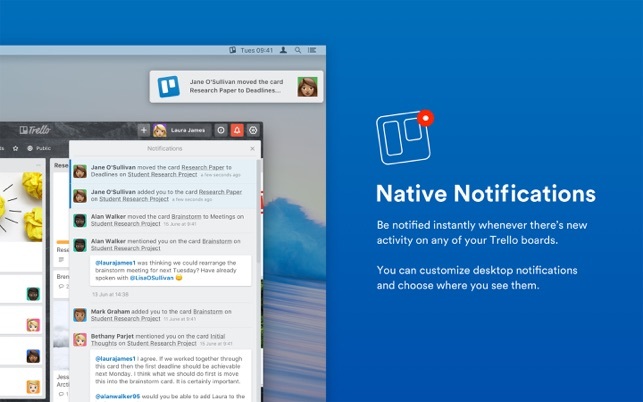 The Trello Desktop App features native notifications, powerful enhancements and more - away from the distractions of your browser. Stay productive with a beautiful minimal interface that doesn’t get in the way of your work. 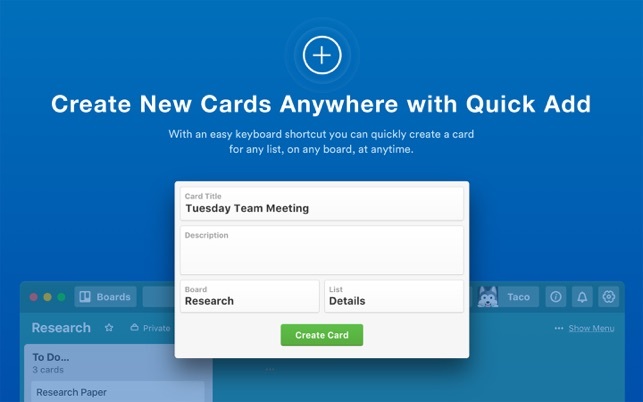 Create new cards instantly from anywhere with a Quick Add window. 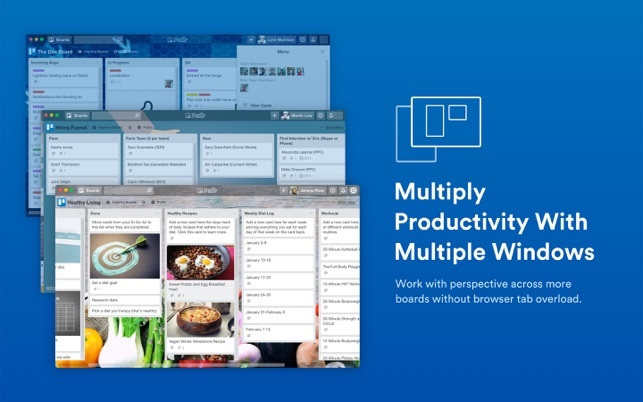 Get notified whenever there’s new activity in any of your Trello boards. Work on multiple boards at once with multiple windows. Set a global shortcut that opens the main window from anywhere. Navigate between your starred boards with a quick shortcut. Use Touch Bar to view starred boards, create new cards, and open new windows. 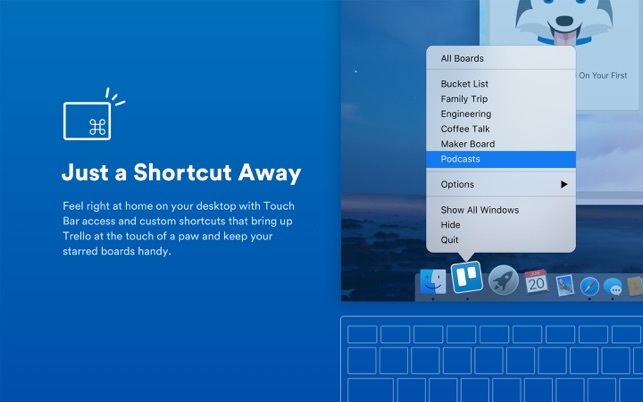 All Trello shortcuts work just like the web, including keyboard shortcuts, drag & drop and more. "Trello is an awesome project management tool that makes collaboration easy and, dare I say, even fun." Fixed: issues related to selecting text on card backs. Fixed: an issue preventing context menus from showing up. Please note that to see context menus you must have Spellcheck enabled! Love using Trello, and rely it on for both professional and personal projects. However, the app vesion is completely unreliable. I keep the Trello window open on another desktop while I work, and after a few moments of inactivity, the window seems to constantly freeze. Frequently it will take multiple clicks to register, then, when it does, it will reset to the home page and any card I was working on is gone. The latest problem now is that after inactivity the app no longer reponds at all and has to be force quit. Update1: It’s 2019, and the app is still worthless. Constant freezes requiring me to quit and restart the app. Now it’s freezing *while* I’m typing entries into a card; I then have to force quit, losing whatever progress I had. Tell me again why this is better than using the website, which, as far as I can tell, works flawlessly? Update #2: After two years I’m giving up and uninstalling this piece of garbage. The app freezes constantly, outright crashes, or loses cards after I try to enter them. The app is completely unreliable and worthless for extended use. It’s fine in short bursts, but as I rely on it throughout the day, it simply isn’t stable enough. The website, by comparison, doesn’t crash, or freeze or lose my data. So, whatever benefits the app held aren’t worth the trouble, I’ll just return to using it via a browser. The main reason to use a standalone app of something you can get in the web browser is that it should be more performant and feel more native than in the browser. This app needs some real work still as it’s neither. It actually seems like it’s just a webview inside an application window, because it gives me the exact same “disconnected from server for too long, please reload” messages I get on the web - unlike the iOS app which has great offline capability. It is also SLOWER and buggier than the web - we’re talking ASANA SLOW, which was the original reason I ditched that and started using Trello... Switching from the list view to the calendar view is particularly buggy. Sometimes it doesn’t work, or there’s a several second lag during which I’ve clicked again three times and then it flashes back and forth the number of times I’ve clicked once it catches up. This is not a computer processing speed issue - I regularly edit videos and photos with less lag than the Trello app. Please make a native app that is actually performant - it’s clear to see you’ve just thrown a web view into an app and put it up on the app store to get another marketing touch point to make users sign up. It’s lazy and below Trello’s normally high standards. This app is good. Its very similar to the website though. Its nice to have an app now on the desktop. But it woudl be great if there were more features. Like drag and drop in the boards menu so you can move boards from one team to another, etc. Also its just a bit clunky still. 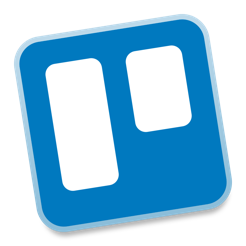 I love trello, use it on my phone and comptuer. Its getting there slowly but surely. Could use some upgrading a bit though. I wish they had a bit more of a way of creating a difffernt type of board. Love the pictures and video links elmetns though. Like instad of just having the dorp down lists having the option to do like a general note pad on one would be great where you can keep typing rather than just bubles or have to open the note and do description. Love the pictures and video links elements though. That way I could move fully off Notes as well and use this for things like journaling ideas etc. As of now its really jsut great for vision boarding and lists. Calander things too but this is a bit clunky. Its more of a reminder option thats kinda nice but i dont use it much the way its set up.